A shipping zone is just a geographic area. You set up the shipping zones that make sense for your business and shipping requirements. For example if you only ship to one country and it costs the same to ship anywhere in the country, you may only have one shipping zone. Maybe you have more of an international flavor and you’re based in Europe and ship to 15 different countries, each with their own shipping calculations, in which case you might have 15 zones. 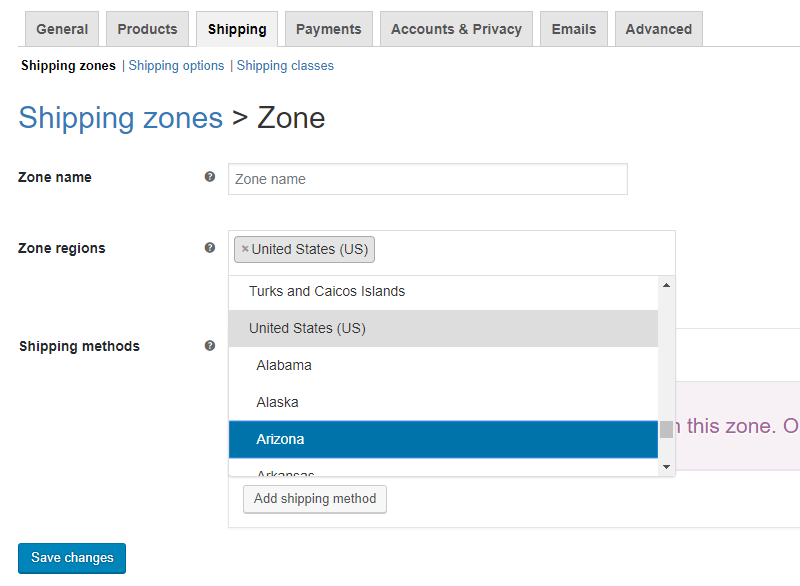 Both those examples are using countries as the geographic boundary, but WooCommerce provides a lot of flexibility when it comes to defining shipping zones. It also allows you to use states or regions and also Postal codes/Zip codes. This provides you with a great deal of flexibility. There is also a default zone called “Locations not matched by other zones”. You can optionally assign shipping methods to this zone. Think of this as ‘catch all’ zone that will match if none of the others do. Although not perfect this system is pretty powerful and meets the needs of thousands of stores around the world. Notice at the very bottom of the screen is built-in shipping zone: “Locations not covered by your other zones”. You can think of this as the catch-all bucket that you can use. You don’t have to use it – but in some cases it might make sense. In one of the examples later we will use this zone so you’ll get to see exactly how it works. Notice in this example that not only can you pick a country (in this case United States) but if a country has regions or states they will be listed as well – in this example you can see the beginning of the States in the US. NOTE: these states are regions are defined by WooCommerce, they are built-in and our Table Rate Shipping plugin does not change them. Along with the Country/State/ZIP etc you will also need to give your zone a name. This is just for your use – your customers do not see it. I suggest you use something meaningful – rather than say “Zone 1”, call it “European Zone”. 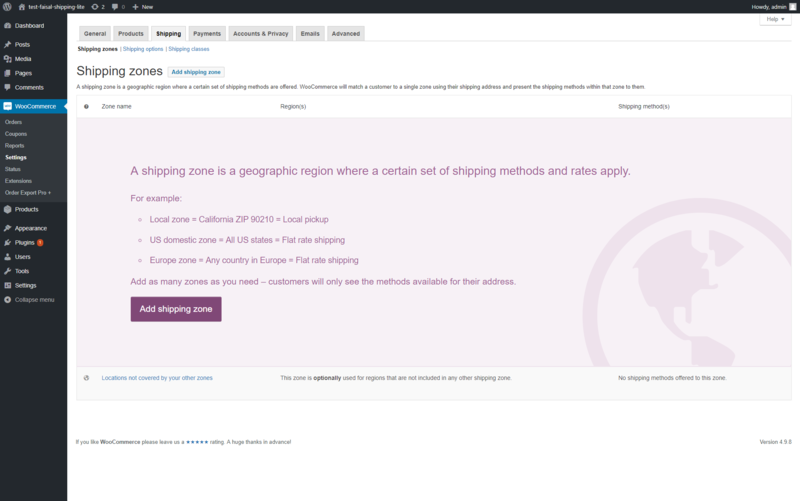 Now you have the geography of your zone all set you need to add a shipping method. A shipping method is simply the way in which shipping will be calculated. There some built-in shipping methods and there are many available as plugins (like our Table Rate Shipping plugin). You are not limited to just one shipping method, you can add as many as you want. The good news is our plugin is likely to fit your needs so you should be able to use just one shipping method, making your shipping setup easier and simpler! Simply select the shipping method you’d like to add – in our case it will be “Table Rate Pro” and click the add “Add shipping method” button to confirm it. That will then add that shipping method to your zone and you will see it listed as one of the shipping methods similar to the screenshot below. So now you have a shipping zone set up with a shipping method. If you still have questions, please feel free to contact us and we’ll do our best to help you out!